Just gotta brag a little this week. Since releasing Free Five at Amazon over a month ago, it has managed to stay in the top 50 for Kindle Fiction Short Stories. Thanks so much to all of you who picked one up. Again, it’s the same stories that I have posted here, but I added author afterwords to each of the stories. They were almost as much fun to write as the stories themselves. Next Friday, I’m pleased to be welcoming back horror writer Hunter Shea for a guest post on what he is calling our “Platinum Age of Horror.” Hunter is also back celebrating the release of his second novel, Evil Eternal. I was recently tagged by both Jonathan D. Allen and Jill-Elizabeth for the #luckyseven meme. If you haven’t seen this meme before at other blogs… well, I’d be shocked. In fact, I was wondering if I was going to be tagged for it, but as I don’t normally participate in memes, I wasn’t terribly surprised that it had been floating around so long without hitting me. 2- (and this isn’t really a rule) it should hopefully be interesting. Because that’s really the idea behind this, right? Writers are always told to make sure to grab a reader with their first page, but what about those readers who pick up a book and flip to a random page. What if it was page 77 of a novel? Or page 7 of a short story? Or whatever. I chose two pieces. The first is from a WIP. I normally remain pretty tight lipped about these types of things, but I was curious what would happen if I followed to the 7’s. Here it is. He thought back on that moment every time he flew, but it carried more poignancy today. Daine Peterson would never touch the earth again. Today he would be released. As the sounds of the aircraft hurtling down the concrete grew to a crescendo, just moments before it would lift away, Daine noticed that his legs were swinging above the floor. He was a child again. He looked down at his little body, the brown pants and white shirt with a clip-on brown striped tie. The front tire lifted from the tarmac. This second choice is from my recently released short, The Interview. Going by the whole rule #2 thing, had you read the description, you would probably guess that the character talking in this excerpt is blind. You can find The Interview at Amazon, Barnes and Noble, and Smashwords. 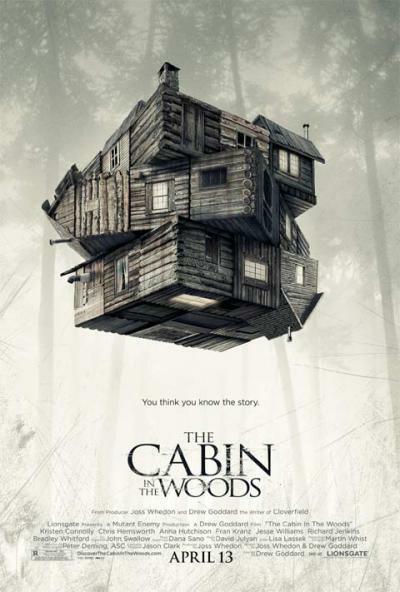 And now for a few words about The Cabin in the Woods. Okay, most of you know me better than that, right? But I’ll try to keep it brief. Mostly because if you haven’t already heard, the best part of the plot is what you haven’t already heard. I had only seen the trailers. Some college kids going to a cabin. Knowing it was from Joss Whedon (of more projects than I can list here, but most people are familiar with his hand in the Buffy the Vampire Slayer series), I was guessing that the campy feel of the trailers was going to be more homage than serious intent. And there was something else. Literally. In between flashes of this cabin were scenes that appeared to be from a lab, or the military. Someone monitoring the kids at the cabin. My first thought as a Buffy fan was The Initiative. If you are also a fan, you know what I’m talking about. If you’re not, it’s not important, because that wasn’t exactly right when it came to The Cabin in the Woods. But I wasn’t far off on the homage. Except in true Joss Whedon style, he takes homage to mythic proportions and weaves it in with something altogether his own. And reminiscent of some of the best Buffy episodes, he manages to create a great balance of horror and humor. Just when your wife is about to draw blood from your arm with her fingernails, he will relieve the tension. I’m not going to say much more than the fact that if you are a horror fan, I believe you will also really enjoy this one. And even if you’re only an occasional fan, this is worth it. I did have a couple of very minor complaints, but they’re both wrapped up in spoiler alerts (and with a little consideration, I can understand why these choices were made) so I won’t go into them here. But if you’re curious, let me know and I’ll talk about it in the comments (with SPOILER ALERTS of course). 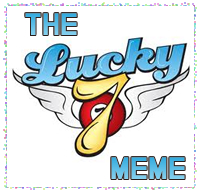 If you have the opportunity, please check out any of the writers’ blogs that I’ve linked to the #luckyseven meme (either the ones who tagged me or whom I tagged). Finally, don’t forget to check back next Friday for a guest post from Hunter Shea. I’m going to see it tomorrow, with my neighbor. I’ll let you know what I think. Hey Erik, thanks for stopping by. I think you’ll enjoy CITW. And I look forward to your lucky seven whenever you get a chance. (This one took me about a week and a half to get to, so obviously no rush). Paul, great exerpts for the meme. I was especially intrigued by the first one. The second one was good, bit I had a vision of Al Pacino in “Scent of a Woman” while reading it. Now that is Horror! And who the he’ll is Theo. I just cracked myself up. I need to sleep. And Al Pacino, eh? Funny. That’s really NOT him, but I can see the connection one might make from that excerpt. Loved your #luckyseven, Paul. Man, you can write! Even the little snippets have that *something* that hooks a reader. Cabin in the Woods? I liked it. I wouldn’t classify it as a horror movie, except in so far as the entire ‘puppeteer’ concept goes. I thought it was more an entertaining way to pose (and perhaps try to answer) the questions “Why horror?” and “What elements do we crave of the genre, and should we be comfortable with what those elements imply about us as a society?” Is there an equivalent term for meta-fiction that can be applied specifically to theater? Meta-cinema? I don’t know. But the philosophical questions felt to be far more the focus than the traditional horror set-ups, although the ‘big bloody mess’ was pretty freaken’ awesome, right?! Hard to talk about the movie w/o spoilers, that’s for sure. What’s the moratorium for silence? When it’s in second run? I just liked the big bloody mess. ha ha. Just kidding. Actually, at those moments, I was hyper-aware of a friend of ours who came to the movie even though she most certainly is not comfortable in horror movies (see Kodi’s comment). And as to the moratorium, maybe we can talk about it at TESSpecFic, just let the other members know it contains spoilers. Not sure who has or hasn’t seen it yet besides Marie. Loved Cabin. I think I would have loved it even if I wasn’t a Joss-Chick, but his humor — and some of his preferred cast — was definitely on display. It also did one of his favorite things — ask the viewer to examine his or her own reasons for liking horror. Michelle, thanks for stopping by. I would agree with you. There were definitely a couple of times where it wasn’t a subtle point they were making, eh? 🙂 It worked on many levels, but honestly, I was mostly just glad to be entertained that particular day. I’m not 100% sure why I like horror (or at least what the main reason is), but I know that I like what he’s done with it here. Thanks again for commenting, and I hope you’re having a good weekend. I was just looking for entertainment, too, and I know I can enjoy it at another level when I see it again. The snippet from THE INTERVIEW is my favorite of the two. I am quite intrigued with the interplay of senses and how losing one can increase the sensitivity and strength of the others. Thanks, Blaze. Obviously with one of the main characters in the story being blind, I play around with that very interplay of senses that you mention. Glad you liked the segment. Hey, Paul. I really loved that second one. It was very creepy and gripping. “The Interview”, huh? I’ll have to check that one out. Thanks for thinking of me. I did one of these a couple of months ago, but since you and another pal hit me with it again, I think I’ll go ahead and give it another go. I hope the weekend treated you well, and that you have a good week. Hey Jimmy. Now that you mention it, I actually think I remember seeing yours awhile back. Ha ha. Yeah, it’s been around for awhile. I was starting to feel neglected in that no one had tagged me (oh, poor me :)). And I certainly think you are justified in doing it again. Glad you liked the excerpt from The Interview. I actually wrote it several years ago, but I enjoyed taking a fresh look and revision with it recently before I published it. You’ll have to let me know if you pick it up at some point. Be curious to know what you think. And hope the same good wishes for you on your weekend and upcoming week.